Designed for readability, this Bible does away with the two-column format and distracting notes in the margins—and it’ll keep you turning pages! The RSVCE Bible has been acclaimed for decades as the clearest, most accurate, and most beautiful modern translation of the Bible in English. If you want to hear God’s voice in your life, this RSVCE Bible is a great place to start. One look and you’ll see that our version is easy to read and hard to put down. 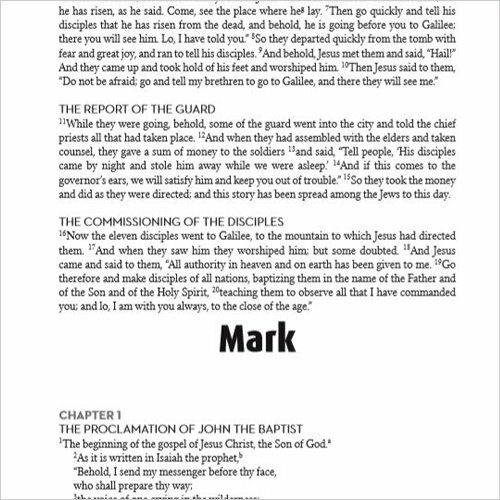 Unlike other Bibles, it does away with the two-column format and notes in the margins, so it reads like an engaging novel.